Sebastian Hale is a wreck. Juniper Rowe, the love of his life, is at a crossroads, and he’s powerless to help her. All Sebastian can do it wait, hoping she comes back to him before it’s too late. But when his past comes knocking, carrying threats of destruction and revenge, it’ll take a whole lotta heart to make it to the other side. Will Sebastian and Juniper be able to find their way back to one another? 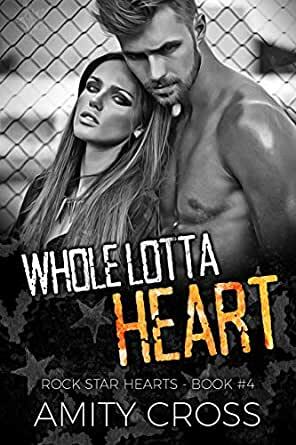 Find out in Whole Lotta Heart, the FINAL book in the Rock Star Hearts series by Amity Cross. In reading the entire series I must say I am very satisfied with the last book. It could have become a "been there-done that" considering the circumstances at the end of book 3 but Ms Cross went deeper in the maturity that Seb and Juniper found with each other. The couple faced the drama and consequences together without adding to it with a level of realism I found refreshing. My only complaint was not seeing the rest of the band together at the end and left wondering about Harry.